A specialized type of adaptive-optics technology that has been demonstrated by taking high-resolution time-lapse images of functioning brain cells might be used to better understand how the brain works. The system is capable of revealing changing details of biological processes in cells over a larger field of view than otherwise possible, allowing "high throughput" essential for the study of brain activity. "We are looking at huge numbers of neurons, so the number of data points you can measure per second is 20 million, 30 million," said Meng Cui, an assistant professor in Purdue University's School of Electrical and Computer Engineering and the Department of Biological Sciences. "High throughput is very important because you want to measure these numerous neurons simultaneously at very high speed and also at high spatial resolution." The method, called multi-pupil adaptive optics, hinges on deformable mirrors that change shape to counteract the distortion caused when light passes through biological tissue, and a "prism array" containing many faceted segments. Each segment produces its own image corresponding to a different part of a microscope's field of view. "That way you simultaneously correct the distortion in different regions and you can look at them all together," Cui said. "So you can see clearly over a wider field of view than before and at high resolution." Researchers used the system to image brain cells called microglia; signaling processes of neurons involving calcium; vasculature in the brain; and "dendritic spines," structures in neurons critical to learning and communication between brain cells. Findings are detailed in a research paper published on May 8 in the journal Nature Methods. "The microglial cells are important for maintaining brain health and recovering from strokes," Cui said. "High-resolution in-vivo imaging of dendritic spines is also of great importance in neuroscience. And calcium imaging has been widely used in neuroscience for in-vivo large-scale recording of neuronal network activity, which demands both high speed and excellent image quality." The system was used to perform time-lapse imaging to study changes in functioning brain cells, in research with laboratory mice. Cells and living tissue contain a complex combination of structures and materials, all having a different index of refraction, which defines how fast light travels while passing through materials. Because of this heterogeneity, light traveling through cells produces blurred images, not unlike the effect of raindrops on a car's windshield. Devices called spatial light modulators in adaptive optics systems are able to counter this distortion by changing shape when voltage is applied, adjusting for the refraction differences. However, conventional adaptive optics systems are limited because they are able to image only small areas at a time. 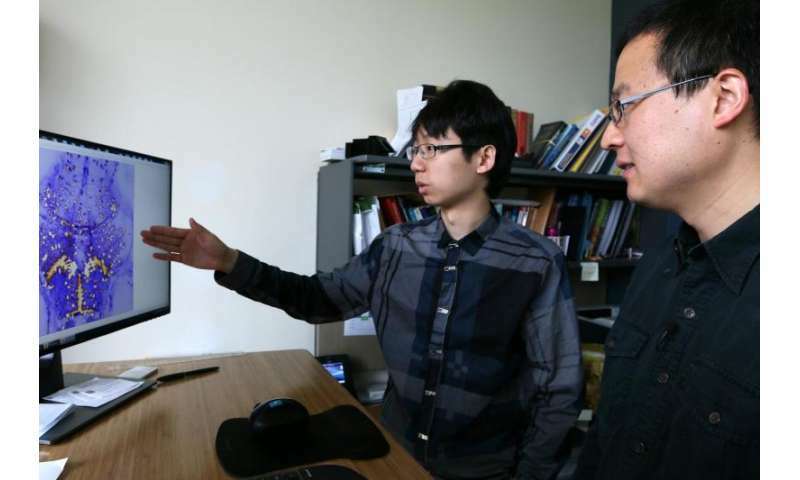 "Multi-pupil adaptive optics solves this problem," said Cui, who invented the method. The initial research used a 3-by-3 prism array containing a total of nine segments, each around a square centimeter. "The current version of multi-pupil adaptive optics is about 10 times better than conventional methods," he said. However, the performance might be improved by increasing the size of these arrays to contain perhaps as many as 36 segments.